Sew easy and stylish with self-drafted patterns! – Go ask Alisa – DIY capsule wardrobe one stitch at a time! Sew easy and stylish with self-drafted patterns! Artistic mind is the greatest mystery in the universe. You can never know when your next inspiration will strike and what will it be! Difficult and sophisticated patterns inspire me as much as the very easy makes, as long as it all comes together into a beautiful and comfortable combination. Besides, people tend to complicate things with no reason, same goes to the field of sewing. This time I decided to use self-drafted patterns and I love the outcome. Boat neckline of the sweater looks clean and classy and layered chiffon skirt is romantic and airy. Another new element that I used is the animal print of the sweater. Here is the note for myself: I almost never use any animal prints! Never! In this case it seemed to be natural combining beige and brown zebra design shoes together with leopard print sweater. Pearl necklace adds elegance and white skirt neutralizes animal prints, so they are not as screaming. Wear this outfit in the city, to a night out or pretty much anywhere else. I am sure you can also try to style it in a sporty way, adding cool sport shoes like Converse. Sweater: This is the technical picture of another sweater from Burda’s website, but it is the same pattern scheme, omit the band at the bottom. Measure your shoulder length, then figure out how long you would like it to be – draft a rectangular. Your sleeve opening should be about 21-23 cm (7″-9″), your wrist opening about 9-12 cm (4″-5″), length of sleeve about 55 cm. Put those measurements on the tracing paper, draw a diagonal line from wrist opening to a sleeve opening. 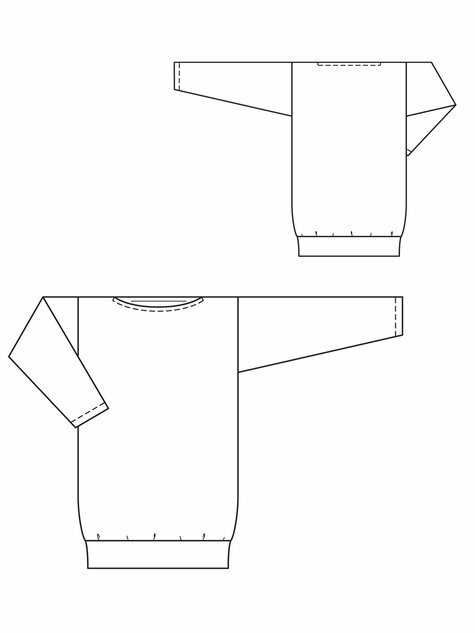 Draft two body pieces (2 rectangular), and 2 sleeve pieces on fold. Stitch all together and your sweater is ready! Skirt: measure your waist, mine is 18″. This will be your elasticated waist band. Then use approx. twice as length as of your waist length if you want a big puffy skirt, if not, use about 10″-15″ more. I used a length of 28″. For all three pattern pieces: 1st layer of chiffon, 2nd layer of chiffon, 3 layer of cotton use the same width ( 28″ in my case). Then depending on how long you want your skirt draft 3 rectangular, with height difference in about 2,5″ difference. Then layer the skirt: cotton lining underneath, then longest chiffon layer, then shortest chiffon layer. Gather them up by running through with widest basic stitch you have and then gathering them up. Add an elastic waistband. Next Next post: Buzz’n Brushes, Las Vegas: moonlight sail.